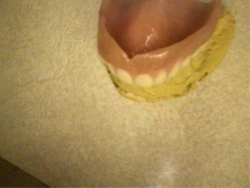 All photos are of real clinical cases from the office. 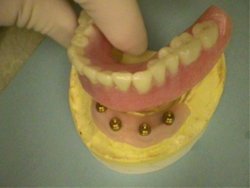 Implants - used to replace a single tooth, several teeth or to support a complete set of false teeth (dentures). 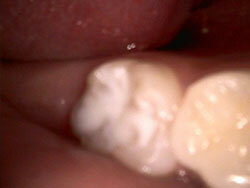 Example of replacing 2 lower molars on the patient's lower right side where teeth #19 and #20 are missing. 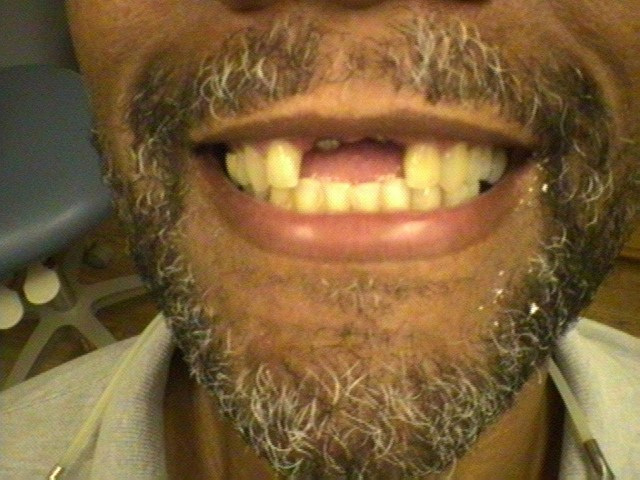 Patient lost two front teeth and presented to office for replacements. 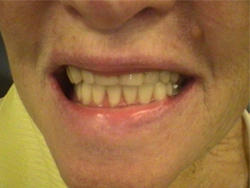 First photo shows patient's smile at rest with missing right and left central incisors. 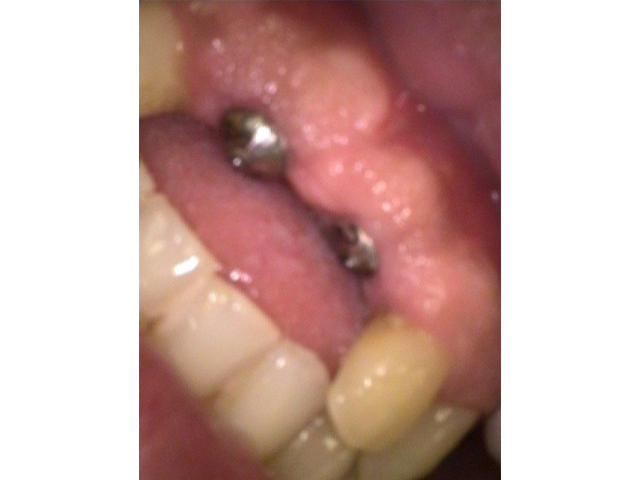 The next photo shows the implants replacing #8 and #9. 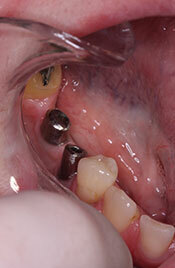 The third photo shows the implant crowns replacing #8 and #9 placed over implants. 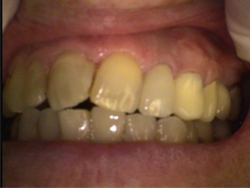 The final photo shows the patient's smile with new implant crowns replacing the two central incisors. 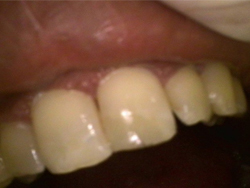 This case shows a patient in which we relined the existing upper denture to give it more retention(Photos 1 and 2).All of the lower teeth were extracted and four implants were placed on the lower arch. 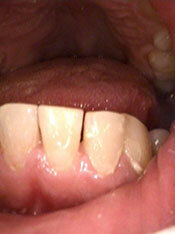 (Photo #3 and #4) )We placed four locators on the lower arch to help retain the new bottom implant overdenture. 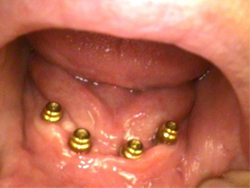 The photo shows the model of the patient's lower jaw and the four implants. 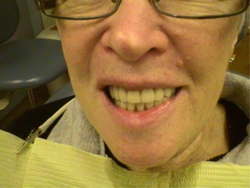 The last two photos show the upper denture and lower implant overdenture with four locators in the patient's mouth. 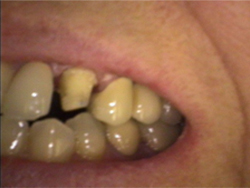 Patient fell on concrete and broke upper left anterior central incisor. 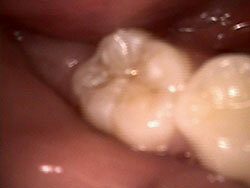 Tooth #9 was fractured obliquely and did not expose the pulp. 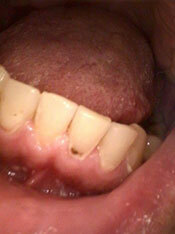 Tooth #9 was repaired the same day with a composite resin filling. 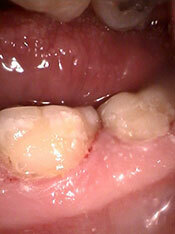 Patient had root canal completed on her upper left canine in the first photo. 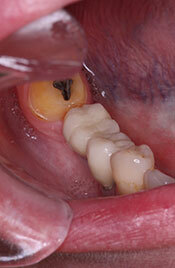 The second photo shows the tooth built up with a core material. 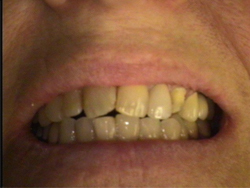 The final photo shows the porcelain crown covering the non-vital upper left canine. 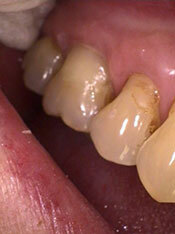 Composites - used to repair cavities with white restorations. 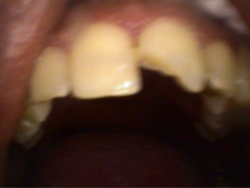 Example of a cavity at gumline on lower left central incisor (tooth #24)-a lower anterior tooth. 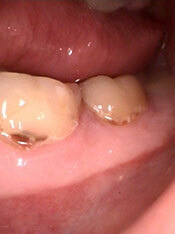 Example of cavity at gumline on upper right first molar (tooth #3) - an upper back tooth. 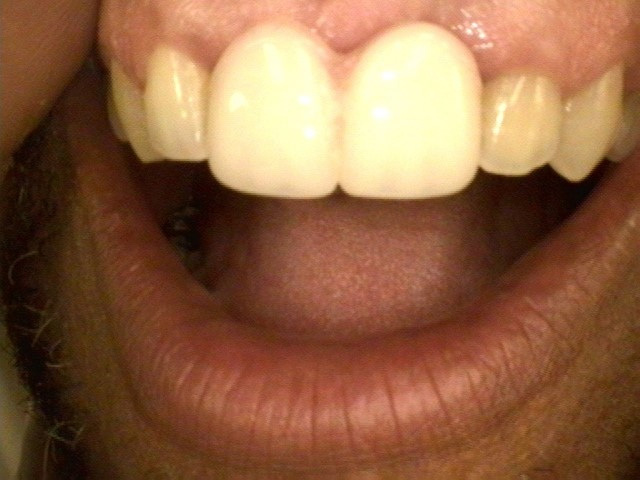 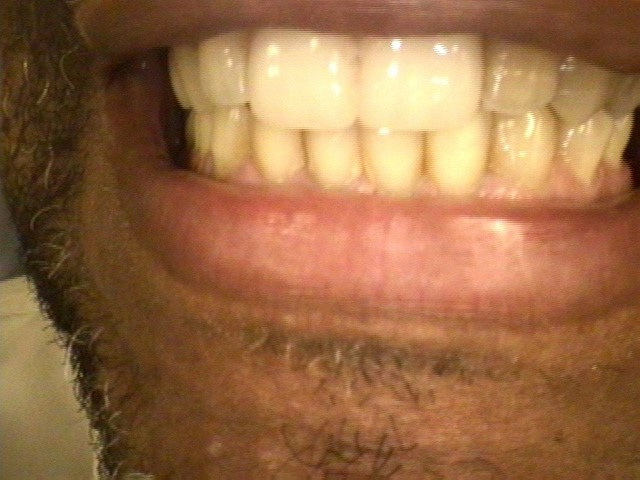 Example of a cavity at gumline on lower left back adjacent molars (teeth #30,#31) - lower posterior teeth. 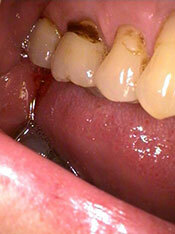 Sealants - material bonded to grooves of permanent teeth to protect from cavities. 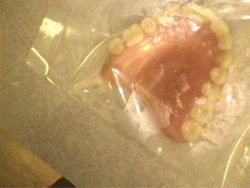 Example of sealant placed on a lowerposterior right molar (tooth #19).